BLOG CHALLENGE! Show me some Spring from where you live or some Fall! We haven't had a blog challenge in a long time! So for those in the spring/summer season hemisphere show me a pic or two of spring where you are. For those in the Southern Hemisphere who are now entering their fall/winter show me a pic of that! ConchScooter posted on a previous thread suggesting a moto update on my thoughts about the differences between my two bikes. 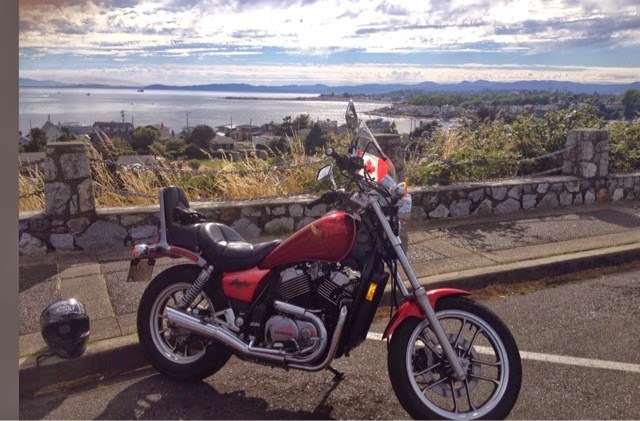 Since 2012 I have ridden a 1985 Honda Shadow VT500c cruiser style bike. I loved my bike, but always felt that I wanted a different style bike and haven't really tried too many different styles. Scarlet had a standard seating & peg position, not the forward foot controls of most cruisers like the newer Shadows, Vstars, Vulcans & HDs. Scarlet was a shaft drive, so she was quite smooth and had the perfect touring seat, big and comfy. I used to call her my barcolounger on wheels. I could ride her for hours on end and didn't suffer from rider fatigue. 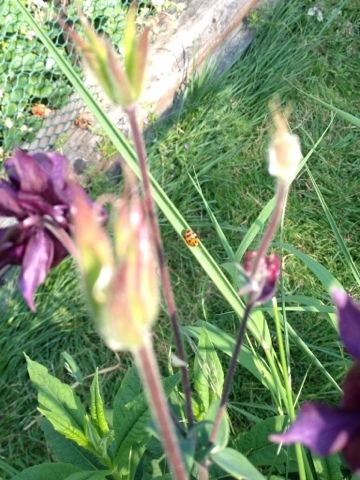 She was very easy to manoeuvre and fairly ergonomically friendly. I loved running cones and parkinglot work on her because she fit me and I knew what she could do. But then something changed for me, I'm not really sure why I even started looking at new bikes or even newish bikes. I was feeling the need for an updated version of moto technology, specifically ABS braking system, bigger tank size and actually better fuel economy and lower kilometers on the speedo. With Scarlet around 140kms I would start looking for a place to fill up, she had disc brakes and no fuel gauge, so if I forgot to zero the trip meter all was lost. A few weeks ago I just started nosing around, but wasn't really in any hurry to get into a big loan situation for a new bike, so I wasn't really serious, or so I thought. Spring means dealer demo days. I am partial to Honda's so thats where I started looking in a seriously unserious way. THE CONTENDERS: Serious contenders: Honda - CTX700T, CB500X, NC750S. At first I considered the Honda CTX700T which is a liquid cooled 670cc parallel twin, sohc, 4 cylinder, fuel injected, 6 speed, 12 litre tank, chain drive cruiser made for touring with ABS brakes. It has a 28.3 inch seat height which makes it ideal for those looking for a low slung cruiser with a forward peg position and standard bar configuration. The engine is titled forward to allow for a lower seat height and lower centre of gravity. The weight is about 500lbs wet. The 2015 faired bike retails for about $7999 Cdn, so its not a bank breaker. 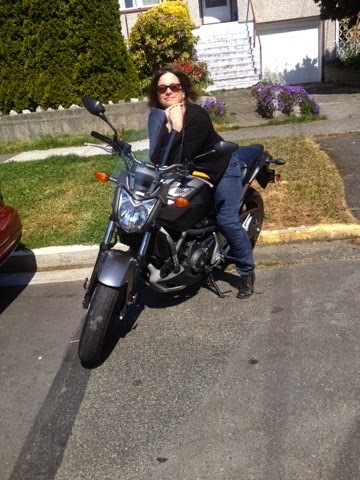 This bike has been selling like hotcakes on the Island, it is popular with new female riders and older riders looking for an easy ride that's fairly agile, but gets good fuel range (3.3 gallon tank) and economy. The engine and frame are based on Honda's NC700 line that debuted in 2011-12. I took the non-faired version for a test drive and was kind of 'Meh' after the ride and very undecided and not eager enough to pull the trigger. I seriously considered it, but a few of the things that made me shy away was the extremely forward foot controls. I actually found the reach a little hard on my lower back after 45 minutes of riding and the seat although it looks comfortable, I felt discomfort at about the 35 minute mark and was squirming around trying to relieve pressure points. At times when taking off from a stop I found my left foot felt like it was searching for the foot peg and shifter. I actually didn't like how close the pegs where to the ground. I also wasn't too keen on the naked non-faired version, I felt like I was being buffetted by the wind too much. The digital speedo/tach/fuel gauge was a little hard to read in the sunlight and the tach is miserably small, but that's just being picky and I think I could live with it. It was pretty fast on the throttle and fairly nimble. But again it wasn't singing to my soul, there were no Moto harps or angels singing celestial moto tunes. It's kind of plasticky looking and fairing and tank are huge and chunky looking. I actually found tucking my knees into the tank was a bit difficult. The dealer had a 2014 faired version retailing at $6999, so it was a great deal and thats why I considered it. Honda also offers hard saddle bags, so once its kitted out for touring it actually looks like a mini Goldwing, which would appeal to riders looking to tour and have a lighter weight bike at more affordable price tag. 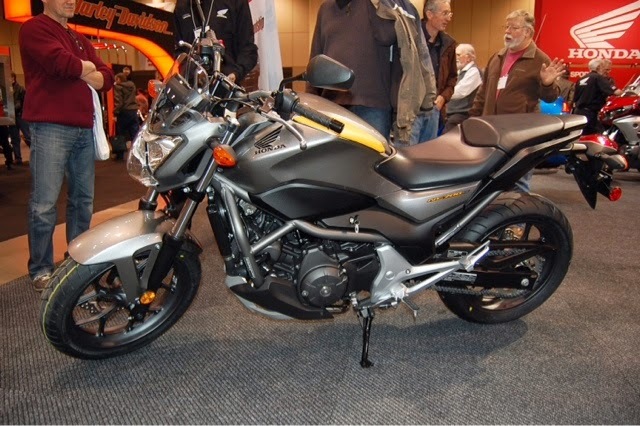 The next bike I REALLY liked was the CB500X (471cc) which is a naked adventure tour style bike. This bike was high on my want list, but in the end I ruled it out because of it being 500cc and I already own a 500cc. It would've been a hard sell to the hub, who thought I was trading apples for apples. But the difference in the apple is 32 years of updated technology with ABS brakes. 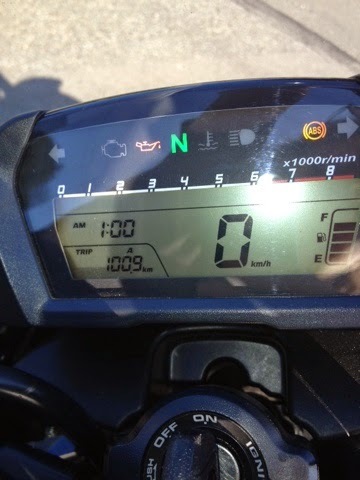 Same digital speedo/tach/fuel gauge configuration as the CTX700. The seat position is a standard upright position with foot pegs straight up & down. Chain driven, DOHC, 4 valves per cyclinder, fuel injected, six speed transmission, 428 pounds wet weight, with a 17.3 litre tank. Seat height on this is 31.9 inches. There really wasn't much that I didn't like about this beastie. I found it very fast on the throttle and extremely maneuverable. I liked the seating position and the windshield stopped the buffetting I was experiencing on the CTX. My wrists did feel a titch achy after riding for 45 minutes. The seat like all motorcycle seats was tolerable, but I think I'd have to do a little adjusting to it & probably go custom or at the very least get a gel seat cushion. The suspension was fairly forgiving. For a smaller or new rider looking for a light weight adventure tour bike this is definitely an option. It's big sister the NC750X adventure tour style has a seat height of 33 inches so it makes it extremely difficult for vertically challenged riders to manage, even with a lowering link this would be a stretch for most under 5'5". The CB500x is retailing with Honda promotion discount for about $6649 CDN. *internet prices and honda deal prices might be out of date. A few other bikes I considered - Suzuki Gladius 650cc, which still had a tall seat height which would need to be lowered. I couldn't test drive it as they didn't have a demo day and it was coming in around $7999 CDN. Ducati Scrambler 803cc, which again I wasn't able to test drive, but there were several factors why it was never really in the running, the main one being price. Depending upon the model you choose it ranges from $9299 to $10995 CDN. Also the seat height was too tall. It also brought me into a higher insurance rate class due to the cc's and replacement value. I also sat on the lowered Ducati 696 Monster and I loved it as much as I did in 2011, but again price was a factor coming in around $8000. All of these bikes bumped up the amount to larger than I wanted to get a loan for, factor in the added freight, PDI, sales tax at 12% and then interest on the loan repayment. So a lot of deliberations and considerations were at play in the process. Then this baby came back into my life, a friend owned her and I used to joke with her on a few occasions we were out riding about her keeping my bike sparkled & polished. The unique thing about this engine is that it's tilted 62 degrees forward to allow for a lower centre of gravity by placing the 14.1 litre fuel tank under the seat instead of traditional tank placement up above. The bike was designed to deliver torque in the low to mid-speed range level. What this means to me as a rider is I have had to get used to 'short shifting', the bike is geared so low that it is a quick shift up to higher gears much sooner than I would have done on my previous bikes or other bikes currently available. In 2013 Honda upgraded the NC engines to 750cc's and made the gear shifting ratio a little longer. The seating position is more of a standard upright position. 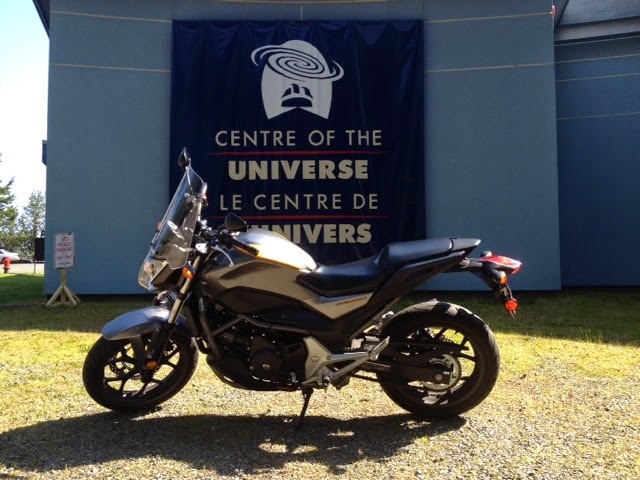 I considered a new 2014 NC750S which retails for $7999 CDN, but again price, extra dealer fees and loan cost was a factor. The NC750X (dual sport style) retails around $8999 CDN. *The DCT transmission model it not available in Canada, but I hear it adds about $1000 to the package. 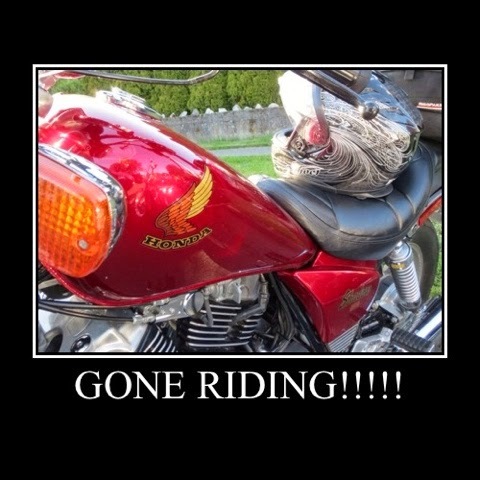 In following reviews and blog reports from owners who have the DCT, they actually love it and say it improves the quality of their riding skill set allowing them to concentrate more on the road and riding environment than shifting. So who knows maybe Honda is onto something. So what does all of this mean to me and how does it compare to my lovely VT500C cruiser bike? I actually love this bike. I love the updated sportier style without having to lean forward onto the tank. The bars still are a little more forward than Scarlet's bars were, but I have learned to compensate for that by using my core and gripping the tank with my knees. Foot peg position is the same as it was on Scarlet, so no big change or adjustment there. The seat however is not as comfortable as Scarlet's and I do miss the suspension and smoothness of the the drive shaft. The suspension on the NC is a single shock, so you do feel the road a little more. I think where the NC leads the race for me is how agile and maneuverable it is. I actually find that she is very flickable and I can throw it around considering she weighs 476 lbs, which is a little less than Scarlet's 483 lbs and that difference is due to the low centre of gravity and the tank being under the seat versus up top. The larger fuel capacity and fabulous gas mileage won me over and that I now have a fuel gauge. The one disadvantage for me is that the Duchess is a little taller, so I do have to compensate for that and am still contemplating a lowering link at some point in the future and possibly a corbin seat. A big driver in the decision process was the linked ABS and fuel injection. The bike feels like it was made for me. I am also looking ahead to my future needs as Scarlet had 31,000 km on the clock so in a very short time her mileage was going to increase exponentially and I already conservatively put between 10,000 to 15,000km per riding season on her, so that was going to be an issue. My new to me NC only had about 4190 km on the odo, so it was barely broken in and essentially new. The 670cc engine keeps me in the same insurance rate class, so I am not paying higher premiums. She was also a private sale with a well motivated seller so was considerably less than what I was looking at getting into monetarily. 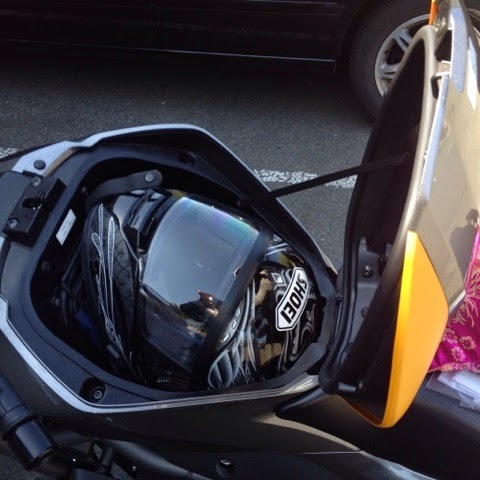 Another feature that I absolutely adore is the 'frunk' which is waterproof and has an 11lb storage capacity and will hold a fullface helmet (dependent upon the size or shape of helmet) or good haul from the grocery store. I missed this from my scooter days, truly only a scooterista or scooterist would miss this, but peeps who ask me about this feature think it is pretty cool and wish it was available on more bikes, which seems to be the consensus of what I've been hearing and reading on the NC700 forum. The farkle list is growing, I plan to add a back rack potentially a top case and panniers then will I have complete hauling/touring nirvana. Ram mounts, GPS, and heated grips (which I already have in a box) will be wired in and I want to wire in a charging unit for my iphone. In doing a mental tally for the farkle list so far I am conservatively up around the $2000 mark already. I have christened her with the name of The Duchess. So overall I am completely besotted with this bike and am looking forward to lots of adventures, I was very pleasantly surprised that I liked the riding position as much as I do and can say I was ready for the change. Will I miss my lovely Scarlet. 2016 Update - a year of riding the NC. I lowered the bike with links from Lust Racing out of the UK. I've added Givi V35 monokey bags and Givi mounting rack. Still trying to determine if I actually need or want a rear rack & topcase (probably not). The only other change I am contemplating is a new gel seat, which is difficult because there is not a lot of after market parts for the NC700S in North America, the NC700/750SA are popular in Europe & Asia. If you have the X version there are tons of options. I am happy with the performance and handling of the bike and have finally found some moto zen. Most of us who blog and use the various social media sites know that the world is actually smaller than it appears. In today's world meeting and making friends is easier, distances are bridged by the internet and connections are made much more easily than in the days of the pre-internet world. Since starting my foray into the blog and social media world in 2011, I have had the opportunity to make friends and eventually meet some of those peeps that I hang out with in blog land; Bobskoot, Troubadour and Trobairitz. I almost met David M, Sonja M and Ed K, but time constraints got in the way of those meetups. It is still a rare opportunity, but they do happen and friendships are forged through the use of modern tech. Friday night I just happened by chance to check into the twittersphere where I saw a picture of our Inner Harbour during full Swiftsure festivities. 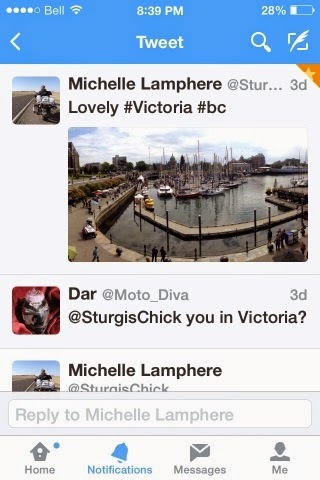 (Swiftsure is an annual sailing event in Victoria) I recognized the picture and the tweeter was none other than Sturgis Chick. I have been following her on twitter and her blog since about 2013. I seized the moment and tweeted her and asked if she was in Victoria, she was and we chatted a bit. 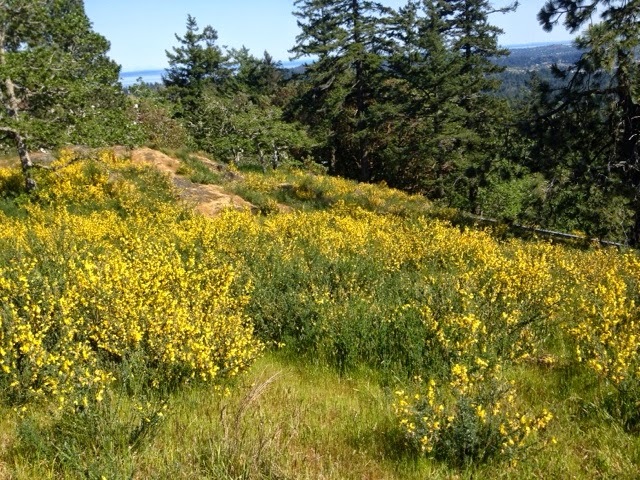 She was staying with friends and on Saturday going to ride the scenic Pacific Circle Loop which takes you from Sooke - Port Renfrew - Lake Cowichan, and finally back through to Victoria. It is beautiful route that winds it way along the coast and has lots of twisties that make a motorcyclist's heart sing. We chatted a bit via twitter, I had some recent intel to share on the shape of the road on the route, in particular there was lots of gravel on the road which isn't unusual this early in the riding season. A few tips about weather, climate, and layering because it can be quite chilly on this ride even in the dead of summer. I was hoping that we could meet up for a cup of the demon bean, but wasn't sure if I could swing it because I was teaching a novice motorcycle course in the morning on both Saturday and Sunday. Luckily Sturgis Chick and her significant other Mad Biker Brian decided to hang out on the Island one more day! Yay! We arranged to get together on Sunday afternoon. It was one of those rare moments when the universe decides that you need to meet someone and you are glad you took the opportunity. Michelle aka @SturgisChick on twitter and her blog https://sturgischick.wordpress.com hales from the legendary town of Sturgis, South Dakota. 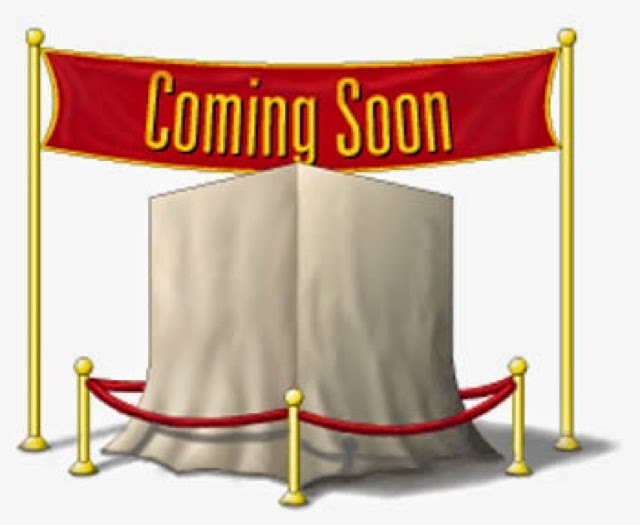 Her blog tag is "South Dakota girl travelling by motorcycle"
When asked about going to Sturgis this year she figures it is going to be insane due to it being the 75th anniversary, the town will see approximately 1.1 million visitors over the 10 day span of the event. Brian is from the UK and his blog is www.onepistononeworld.com. Both love adventure and have done extensive travelling on their motorcycles and have travelled the world on two wheels. Some of the amazing places they have visited are; Brazil, Argentina, Chile, Bolivia, and Peru. Brian has travelled through 17 different countries. Together they are the dynamic duo of motorcycle adventure. I spent a lovely afternoon chatting with them and hearing of their tales . Their motorcycles tell the story of their travels when you look at their panniers covered in stickers from all the amazing places they have gone. 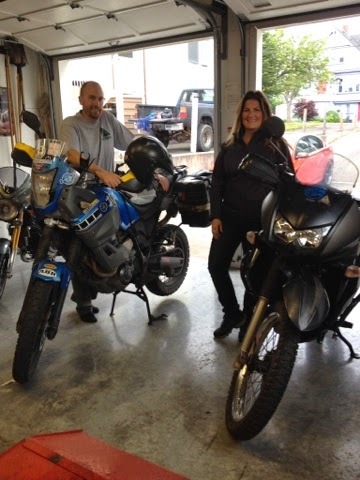 Michelle rides a Kawasaki KLR650 and Brian a Yamaha Super Tenere. Hearing their stories strikes up the vagabond chord in my heart and makes me yearn to do a little travelling and see the world on two wheels. Life on the road is not without adventure according to Michelle, from flat tires on desolate roads to seeing black bears and a not so wonderful adventure on the Canadian Trans Labrador highway back in 2013, where she unfortunately had a crash which resulted in a badly fractured leg on a very remote highway out in the Maritimes wilderness. Luckily one of our Royal Canadian Mounted Police highway patrol officers happened by and saw to her safety. The road is so remote that it took 2 hours for the ambulance to arrive and another two hours to be transported down a jarring gravel road to hospital in Goosebay. Michelle was medivacked to St. John's Newfoundland for extensive surgery to repair the broken leg. 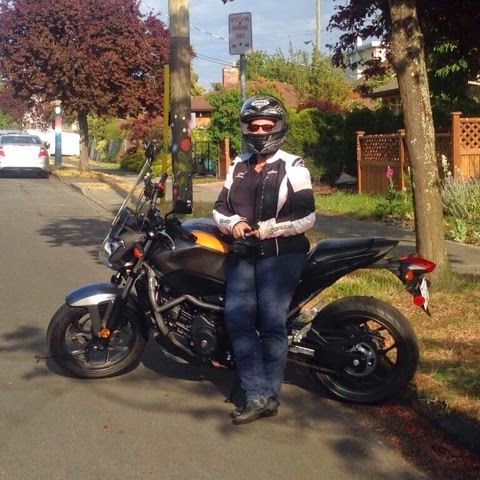 The good thing that came out of her accident was the motorcycle community in Newfoundland rallied together, a generous moto soul transported her bike 1000km to rest in a garage and wait for her to heal and venture forth. Other wonderful Canadians opened their doors to her so she could recuperate and heal. I am so glad that kind hearts still exist in this world and offer up their hospitality to someone in need. That was quite the tale and I am glad she is here to talk about it. She attributes her survival to the good gear she was wearing. When the paramedics cut her boot off to assess the fracture, they said it would have been much worse had she not been wearing gear. Hopefully one day I will make it down to her neck of the woods and go riding in beautiful South Dakota, but the offer is always open to her and Brian to come back and ride some more of beautiful Vancouver Island, I happen to know some lovely twisties that are pretty spectacular rides. Michelle and Brian have left our fair city and are making their way back to their home base of Sturgis, South Dakota. I am sure there will be many more adventures in their future and lots of great stories on their blogs. 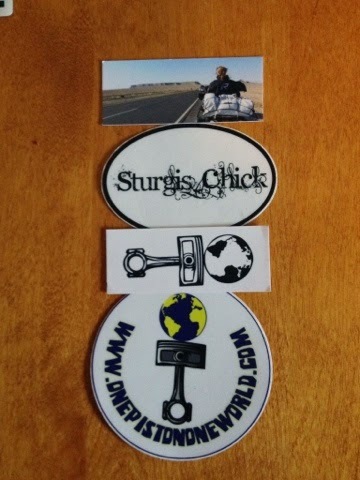 Do check out their blogs, Sturgis Chick and Brian's Blog One Piston One World and follow Michelle on Twitter @Sturgischick. Here's wishing you both a happy safe adventure home and it was so lovely to spend a few hours chatting with you both about bikes and adventures! Ride safe and keep the shiny side up. 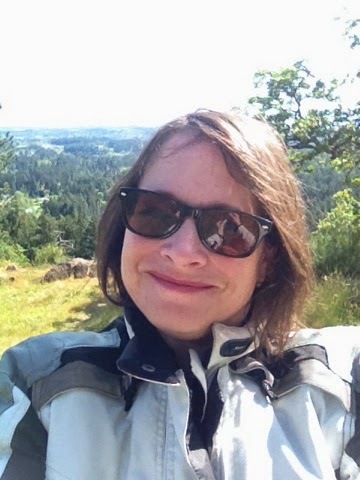 A few months back I had a lovely chat about motorcycling,travel, safety and tech, with Michael who is a fellow Motoblogger and rider who lives in Key West Florida. Here is the link to our chat Travel And Safety Podcast. He has other great interviews with very cool peeps! I can't believe I have a new to me bike. That makes it 4 bikes in 4 years of learning to ride. I wasn't really looking for anything new, because I actually have been pretty content and in love with my Honda Shadow VT500c. Scarlett came to me as a wonderful Christmas present 2 1/2 years ago with about 9,000km on the odo and she just recently clocked in at about 31,000 and change. We have gone a lot of kilometres in that 2 1/2 years. 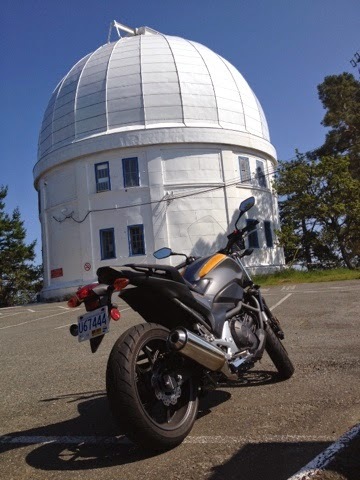 Way back in 2012, I wandered by the local Honda dealer and sat on the NC700SA and it was instant love, but timing wasn't right. I would amble down to the dealer and sit on the different models, but was always pulled back to the NC. 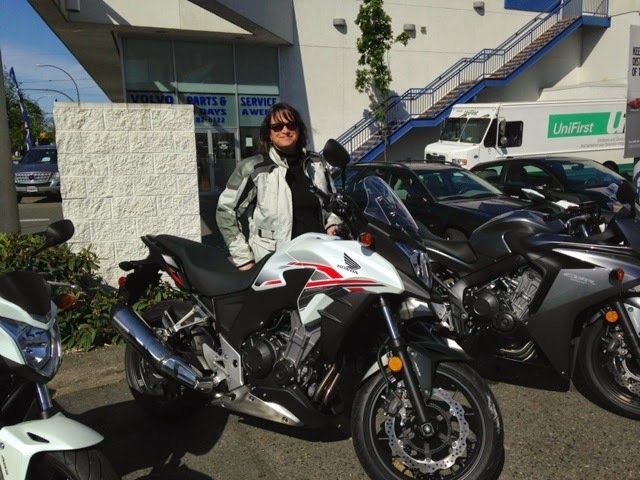 Recently I tested out the Honda CB500X, during Honda demo days. 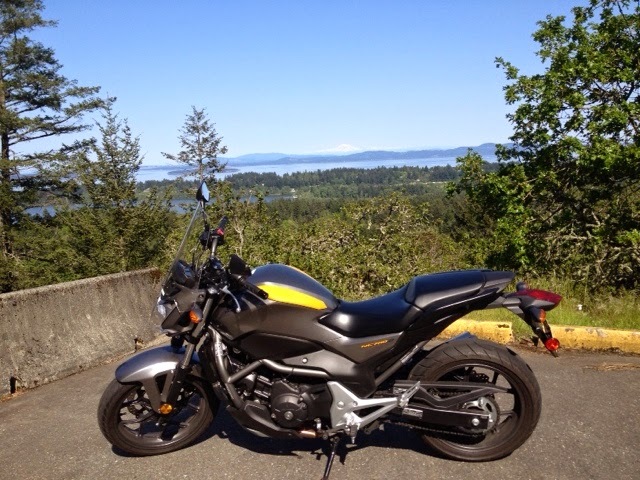 I really really liked this bike, so much so that it was displacing the NC from my heart. The CB500X is in Honda's adventure line and is the sibling of the NC750X. There is a world of difference between the 2 bikes. 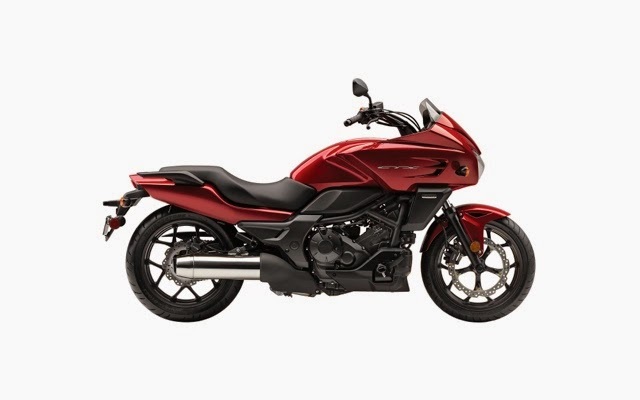 For me the NC750X is heavier and unfortunately way too tall and I wasn't sure they could lower it enough and lowering it added to the price so it was a no go. 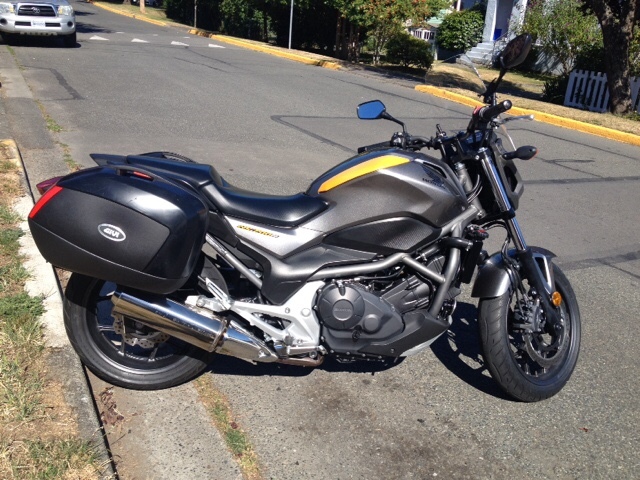 The NC750X is running around $8k before tax, freight, PDI and necessary farkling. The CB500X was about an inch shorter and less weight. It runs about $7k. I actually almost pulled the trigger on the CB500 after riding it, but became concerned that I might feel limited by the cc's. The fickle hand of fate intervened and I walked away ftom it and decided to think about it. This beautiful babe rolled back into my life. 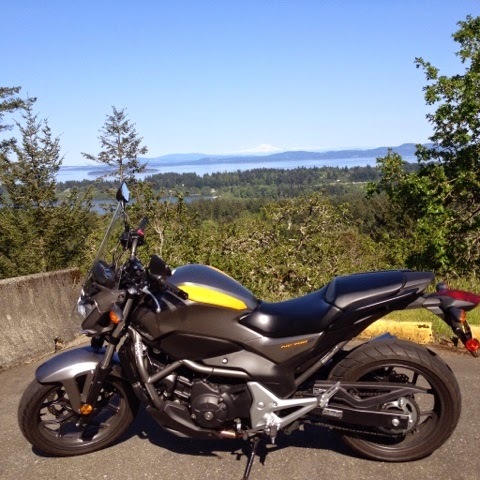 This is the bike I had been drooling over in the local dealer back in 2012.A friend if mine bought it and rode it occasionally. Everytime I'd see her, I'd ask her how my bike was. We used to laugh about it and I'd tell her to look after it. I called her up out of the blue last week and asked if she wanted to sell it. She called me back and 2 test rides later a deal was struck. It followed me home like a lost puppy looking for it's owner. So off we went to get acquainted and figure each other out. The NC700 is kind if a hybrid bike, the original chassis is from the Honda Integra scooter. It has a very low centre of gravity, the gas tank is under the seat. They only sold the 6 speed manual transmission in Canada and not the dual clutch, which offered you different modes to play with and run the bike in automatic. The bike has ABS which I am really excited about as a feature. This is where the scooter ingenuity comes in, there is onboard helmet storage! I LOVE THIS! 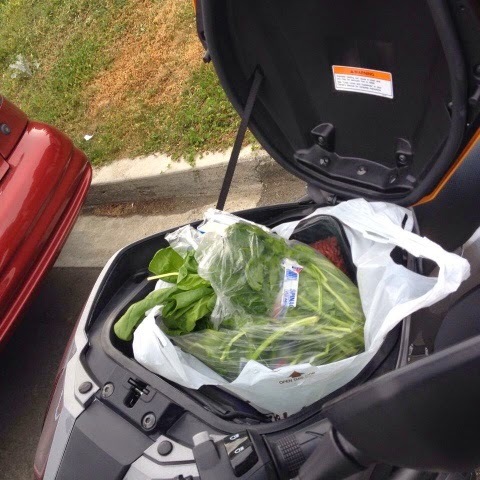 I always thought it was the best thing on my scooter, instant storage and hauling capacity. It allows me to get away without having to kit it out which is a good thing right now, I need to pay it off before farkling commences. 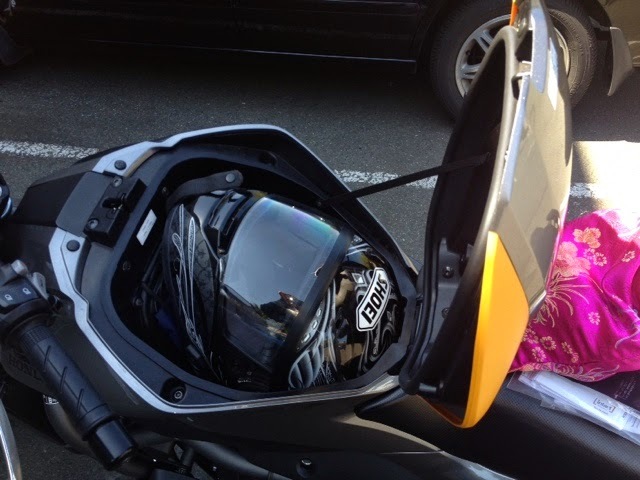 My fullface Shoei with Sena unit is nicely accommodated. It also gives me a handy place for my insurance papers. I used the compartment plenty today after a quick run to the grocery store. Today was the perfect day for us to get to know each other. It was hot and sunny, I could hear the twisties calling my name. The NC obliged and handled them nicely and with ease. It is taking some getting used to because it is designed to have low revs and I had to figure out short shifting. It's an amazing commuter and sips gas, on average it's about 400km per tank on 14 litres (3.73 gallons). I filled her up from empty and it was $13. I went about 100km today and used on 1/4 of a tank, if was Scarlett she'd be getting a little thirsty by this point. 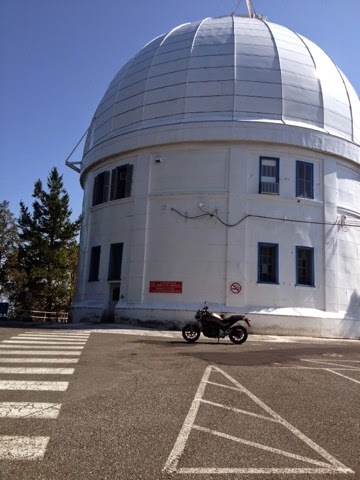 We tootled up to the Observatory. The view is amazing! Hawks were flying by soaring on the thermals. 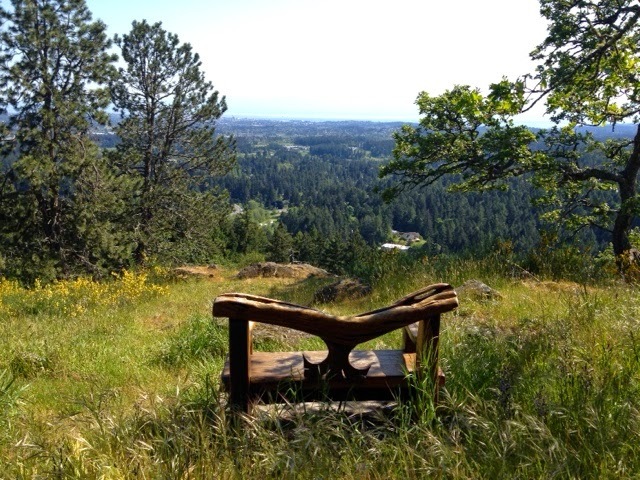 I never get tired of looking out over the straight of Juan de Fuca. 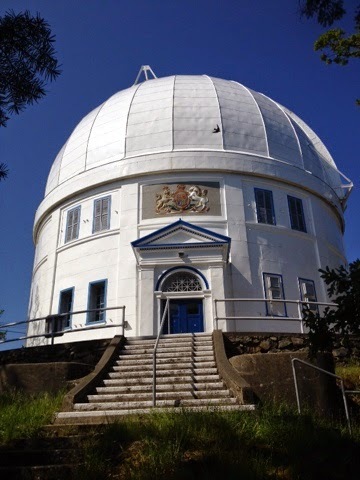 The Paskell Observatory opened it's doors in 1918. The building is beautiful and the grounds surrounding it are open to the public. 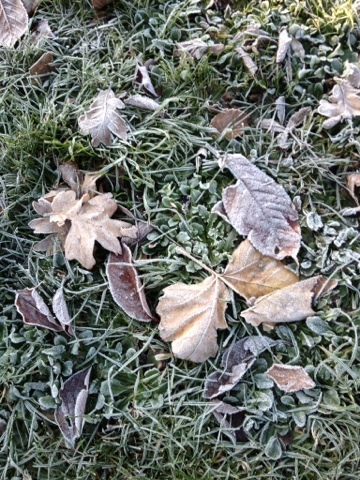 I wandered around for a bit enjoying our stunningly beautiful weather and sights. In the distance you can see Mount Baker. The iPhone doesn't do it justice at all. I haven't named her yet, I think we need to ride together a bit and I am sure it will come to me. I think I stood in this spot and took a pic when I first got my scooter. So 100.9km later and we are both feeling the love. As for Scarlett, she stole my heart, but I think she is ready for another home with hopefully a new rider so they have the most gentle lovely ride that made me fall in love with her and fed my Moto passion for riding.